Wallace Gray, Kirk Chair of Philosophy, Southwestern College in Winfield, Kansas writes Governor William Avery of Topeka concerning civil rights legislation. Mr. Gray expresses his support for legislation that would reduce discrimination of minorities at the local level. The letter describes an effort by college students to integrate the downtown barbershops of Winfield and includes a one page report on that subject. 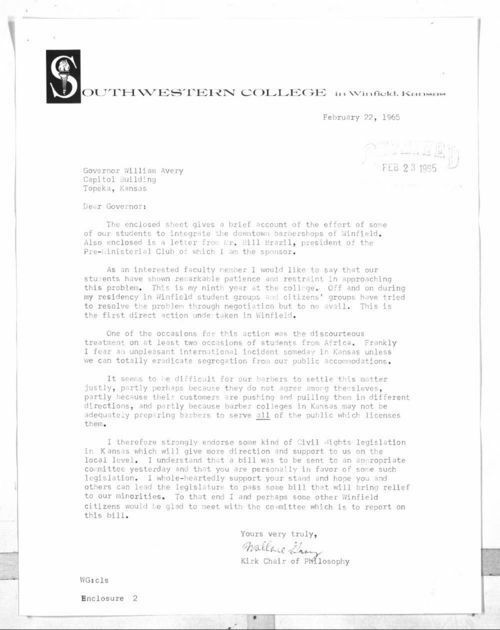 A letter from the Pre-Ministerial Club, Southwestern College, advocating civil rights legislation and the integration of the barbershops of Kansas is also included. An effort to strengthen the Kansas Act Against Discrimination in the form of a "Fair Housing Bill" (Senate Bill No. 166) was currently being considered by the legislature. Local concerns such as these reflected a national debate on civil rights reform that resulted in the Civil Rights Act of 1964 and the Voting Rights Act of 1965.